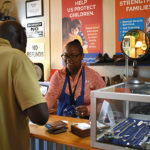 With the news of San Diego’s outbreak of hepatitis A — which has infected more than 400 people, killing 16, mostly in the homeless community — San Diego Community News Network decided to catch up with the Hillcrest Business Association (HBA), and find out how this neighborhood can rise above the dire situation facing Downtown residents. It’s widely known that Hillcrest residents and business owners have noticed an uptick in vagrancy in recent years and on occasions some people have experienced aggressive behavior. 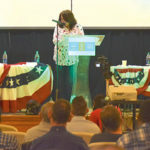 It is a common topic of conversation among friends and colleagues and has often been an agenda item at Hillcrest resident and business group meetings. 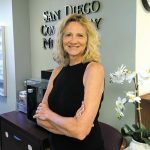 The goal of the HBA, the oldest business association in San Diego, is to offer business improvement services, which are focused on helping the retail businesses and other operations that reside within the business district. 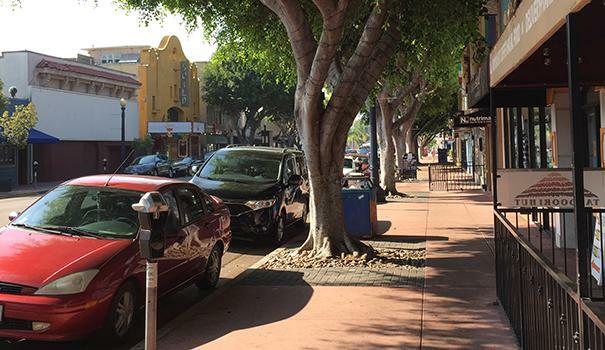 Under the HBA’s Hillcrest Clean & Safe umbrella — which is modeled after San Diego Downtown Partnership’s successful Clean & Safe program — initiatives have a variety of funding sources and many go over and above traditional business improvement. Clean & Safe services include issuing permits for sidewalk signs, furnishings and encroachments; providing security team patrols; steam and power washing sidewalks; litter pick-up; maintaining over 50 trash and recycling cans; on-call large item pickups; undertaking special cleaning projects; gardening; trimming more than 200 trees; and maintenance of the Hillcrest sign and Pride Flag. 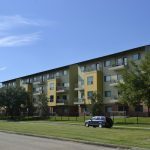 Specified Maintenance Assessment District (MAD) funds for these efforts cover the core of Hillcrest, which is approximately 17 blocks in an area that generates out from the Hillcrest sign. 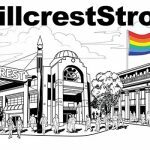 That leaves a lot of what residents, businesses and others who frequent the neighborhood would consider “Hillcrest proper” out of the loop. “These areas were defined over 20 years ago when certain areas were busier. Businesses have come and gone, and density has shifted,” said Eddie Reynoso, marketing and member services director for the HBA. As a result of these shifts, there has been a push in recent months by the HBA to expand services into an East MAD — which would include the areas on the end of Hillcrest that houses the Pride Flag. Adding to what the homeless community already brings to sidewalk wear-and-tear is bar traffic and bus stops, as well as the ficus and Jacaranda trees throughout the neighborhood. Normally, sidewalks in the core area of Hillcrest get steam cleaned/pressure washed once a month. Areas outside of the core were cleaned every six months. With the hepatitis A outbreak, this is changing. HBA recently launched a pilot program where additional steam cleaning could be member-sponsored, or “elective,” meaning a business within the core could pay to have their area steam cleaned on a block-by-block basis. On Sept. 12, the HBA board voted to extend that program to those outside of the current MAD. Reynoso said because of the reclaimed water process used in the steam cleaning, the program would require that each business on an entire block face participate, in order to maintain the viability of set-up and breakdown costs. 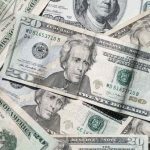 Councilmember Chris Ward heard about the program and decided to offer a $5,000 matching grant from his Community Project, Programs and Services (CPPS) funds for those business owners who opt into the elective program. Ward — whose District 3 includes Hillcrest, Mission Hills, North Park, Normal Heights, University Heights, South Park, Golden Hill, Little Italy, Bankers Hill, the Gaslamp Quarter, East Village and other communities of Downtown — is allocating a “major portion” of the CPPS discretionary budget to assist Hillcrest in this endeavor. The council member has also asked the county to install six free-standing hand-washing stations in Hillcrest for the homeless to use. A representative from Ward’s office said they are now awaiting approval and a timeline for installation. Reynoso is also ramping up another initiative modeled after Downtown’s Clean & Safe program, the weekly “Walkabout,” where Clean & Safe staff meet up with residents and other stockholders at a different location each Friday and put their eyes on a different area of Hillcrest. Reynoso said his trial run also uncovered damage to the John Wear Hate Crimes Memorial Plaque on University Avenue, assumedly caused by heavy equipment of city contractors. They also found a chair hidden in the foliage of a tree. The first official Hillcrest Member’s Walkabout will take place Friday, Sept. 22. Each week will cover one of five different “zones” around the neighborhood, the first being Front Street to Sixth Avenue between Washington Street and University Avenue. Zone 1 meet-up will be at Bread & Cie. Times are still to be determined. Those wishing to participate should email Reynoso at eddie@hillcrestbia.org. —Morgan M. Hurley can be reached at morgan@sdcnn.com. Weekly walkabouts will take place every Friday in Hillcrest starting Sept. 22. Meet-up time is still to be determined. Meet in front of Bread & Cie, 350 University Ave.
Meet in front of Crest Café, 425 Robinson Ave.
Meet in front of Babycakes, 3590 Fifth Ave. Zone 4: University Avenue to Herbert Street, and 10th Avenue, Vermont Street, Richmond Street and Cleveland Street. Meet in front of Lestat’s, 1041 University Ave. Zone 5: Park Boulevard, between Robinson and Lincoln avenues, and University Avenue, from Richmond to Park, and Normal Street/Pride Plaza to Harvey Milk Street. Meet in front of Industrial Grind Coffee, 1433 University Ave.